My hair loves oil, not so much coconut oil as I've documented previously but there's not much oil that I've not tried whether alone or blended. When I was introduced to Alchemy Oils, they promote age old Ayurvedic practices of using oils to massage the scalp to give healthier hair. This is something I've grown up being told to do, grease and massage the scalp. The oils cater for all hair types. I wanted to try their blends and see how they worked for me. 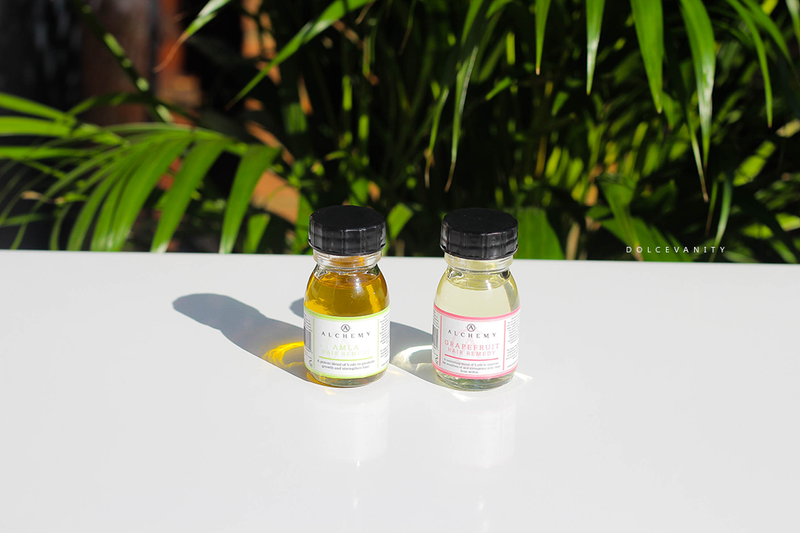 I was sent two travel sized bottles of Amla Oil & Grapefruit Oil. The brand is certified by Peta, cruelty free and registered with the Vegan Society. With a rich source of antioxidants and nutrients such as iron, vitamin A, C, fiber, potassium, magnesium, and calcium. Amla fruit is high in essential fatty acids and also contains water, protein, and carbohydrates. It's good for hair growth, used as a massage oil it'll help stimulate the blood circulation on the scalp, promoting hair growth. While being able to heal dandruff, prevent grey hairs, thanks to the antioxidants, darkens hair, imparts shine, deep conditioning treatment and also a cleansing agent. Alongside the Amla oil, Coconut, Avocado, and Argan oils & Lemon Essential Oil is used to aid the shine and naturally cleanse. Massaging with grapefruit oil on the scalp, promotes healthy hair, imparts hair growth and shine. Cleans the hair from build up, fights dandruff, the scent is naturally uplifting for the senses. Within this combination it also contains Coconut, Avocado, Almond and Castor oil to help alongside the key ingredient of Grapefruit Oil. Castor oil is known to prevent hair loss, help hair growth. Avocado Oil is a natural humectant, drawing and locking in moisture to wherever it's applied. Sweet Almond Oil, penetrates the hair shaft, moisturising from inside and protects from hair from heat styling. Coconut Oil is an anti oxidant and disinfectant and it protects the hair. Whenever I do my hair to leave it naturally curly, I will moisturise and seal with an oil to lock in the moisture. While when my hair is straight all I use are oils because they give my hair enough moisture and keep it lightweight. These oils are good to use nightly for a massage, drop a few in my hand and begin using my fingertips and spend 5 minutes massaging the head - sometime using the inversion method where I flip my hair to the front, bend forward so the blood rushes to my head and massage. Travel sized £9.00 each - full sized £24.00 - £27.00 each.